Heath suffered only a fourth defeat of the season, in their 19th Yorkshire One outing, when edged out by 34-32 in a gripping encounter at home to Beverley yesterday. The damage was done in the opening 12 minutes of the second half when the upwardly-mobile visitors, who had turned round 18-17 in arrears, surged into a 34-18 lead. Heath came roaring back with tries from Seife Boussadda and Callum Harriett-Brown’s second of the game but Beverley held on doggedly as Ezra Hinchliffe’s ambitious drop goal attempt missed the target by some way. Moortown are long gone in the title race but Heath still have an advantage of seven points over Pontefract and nine over Beverley in the race for second-place and a likely promotion play-off game. 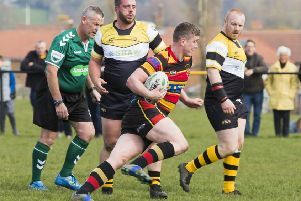 The North Dean men still picked up a losing bonus point and a four-try bonus from the Beverley encounter and coach Dave Harrison was far from downbeat. “That was as well as we have played for a long time. I was reasonably pleased with the performance,” he said. “If we bring that game every week we will beat the vast majority of teams in our division. Heath had won the first meeting in East Yorkshire by 36-18 in October but Beverley are a different proposition now with a solid enough pack, excellent stand-off and full back in Phil Duboulay and Luke Hazell and a great work ethic. They have won five in a row in 2019. Harrison’s men are not as dominant in the scrum without broken arm victim Olly Cook but it was defensive lapses which cost them yesterday, the first on three minutes allowing centre Will Turnbull to score. Duboulay, who had a faultless afternoon kicking from hand and tee, added the first of four conversions. A Hinchliffe penalty, which went in off an upright, reduced the deficit and Heath swept in front when Dan Cole’s break produced a converted try for lock Alex Patrick, a recent signing, on 12 minutes. Duboulay made it 10-10 shortly after but the cut and thrust nature of the game continued as flanker Jason Merrie’s fine run and off-load allowed speedster Harriett-Brown to touch down for an unconverted try. Beverley swept back in front, by 17-15 on 28 minutes, when scrum half Rob Smith found it all too easy to surge over the line after picking up from a ruck. A Cole kick into the in-goal area was a fraction too strong for the pursuing Hinchliffe, who still gave his side an interval lead from the tee after Beverley came under the cosh and conceded successive penalties near their own line. Duboulay’s straight 40 metres penalty on 43 minutes was followed by a try from centre James Graham after good work from Hazell. Heath’s lack of cover was then exposed when the ball was kicked behind the posts and Turnbull pounced with no home player in sight. It looked game over with a 16-point margin but Heath upper their game. Boussadda scored a converted try from a driving maul and after Isaiah Spooner had been ruled held up over the try line, Hinchliffe created the opening for Harriett-Brown to go over at the side of the posts. Dan Cole converted with Hinchliffe temporarily injured and the gap was down to two points with five minutes left. Beverley looked out on their feet and Heath moved in for the kill but the visitors dug deep and Heath should perhaps have attempted to drive the ball nearer the posts before Hinchliffe’s ill-fated drop goal attempt.